It's not often I can agree with a Muslim cleric. I can't believe I missed the news that a month ago, Sheikh Muhammad Munajid called for death to all mice, real and fictional. He "claimed the mouse is 'one of Satan's soldiers' and makes everything it touches impure." (See the full article at the Telegraph). I could not agree more. Also from the article "...he warned that depictions of the creature in cartoons such as Tom and Jerry, and Disney's Mickey Mouse, had taught children that it was in fact loveable." Don't worry Mr. Munajid, I'm not fooled. Mickey drives me nuts, not in small part due to my extended family's fascination with all things Disney. And, frankly, I could do away with Tom and Jerry too if need be, though those guys crack me up. My real beef with mousedom, though, is the one in my apartment. I saw one dash across my kitchen floor one evening. Hadn't seen it in a week and thus thought it met its demise. No. Evidence was provided yesterday--on my countertop--that proved that the mouse (I'm hoping singular) is alive and well and apparently partying it up while I'm at work and asleep. I have no sympathy for the mouse. I hate it when people get all "Oh, catch them and set them free." What? And then drive it 400 miles to a field? I'll reserve my sense of compassion for other creatures and occasions, thanks. I know it's one of God's creatures (or Satan's depending on who you ask), but so is mold. I don't want either in my living space. My landlord, God love him, provided sticky traps and cheap wooden ones. I haven't the stomach to deal with either. 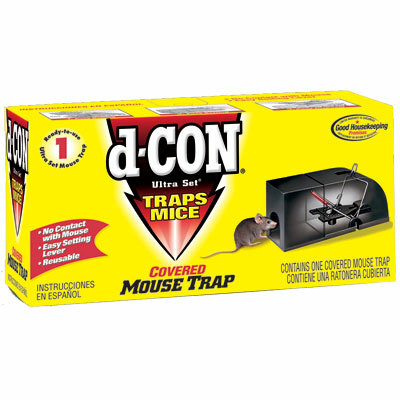 I have acquired what I consider to be the Cadillac of mouse traps--the D Con Ultra Set mouse trap. So far, my faith in this trap has been tested. I have not yet caught it. At least not while the trap was on the floor. I have--gulp--moved the trap to the counter, hoping that will do the trick and hoping its friends aren't crashing on its sofa. I used these traps when I lived in a mouse-infested dorm room one summer in grad school. I caught EIGHT in less than a month. That was my first encounter with mice in my living space. The second was at my last office--where we also used these traps. I am torn between desperately NOT wanting to see the mouse when I go home and wanting to have caught it. I guess I'll choose the latter. This is one of those occasions I wish I had a man around. Or at least a very butch woman. I'm pretty independent but mice give me the heebie jeebies. Duude. Those things carry disease. And they're not completely dumb. Release it somewhere else and watch it stroll right back to what it knows is a reliable food source... your house! Hate 'em, hate 'em, hate 'em. You have my sympathies, so (eew) good luck with your traps! Thanks, Anne! Yes, things are heating up...still haven't caught it.